I have a serious complaint to make. 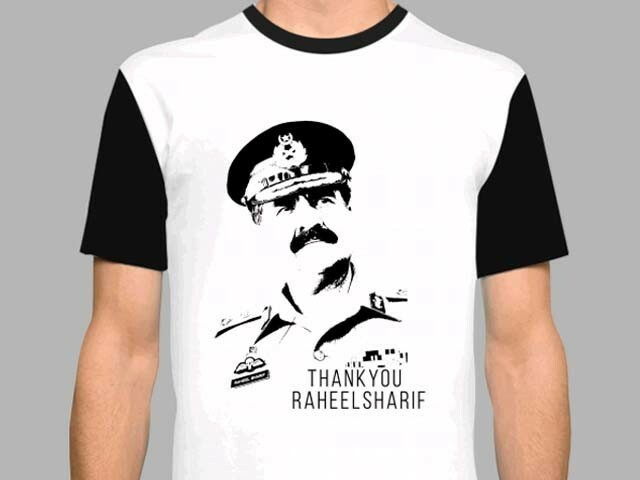 You must know… but of course you do… that there are now T-shirts out there with that man Raheel’s picture on them. God, this is too much! I am the PM not he! Why have you allowed this to happen?? Please God, remember that I am still weak although I don’t look it, because I have just had a very big operation and although many people don’t believe it (they say I went to my London apartment in Mayfair… how delicious that sounds… just to hide when that stupid Panama information leaked out but you know I didn’t, it was just lucky timing), if anyone needs proof, I can show them where they cut my chest open and did things to my heart like how it was done before Shab-e-Mairaj, and no I’m not trying to go that route, I leave that to Mr Improper Khan, and to that Tahirul Dharni who is back again, and that quack na- Liaquat. Look, I try as hard as that Raheel man but I can’t help it if I don’t have a smart uniform and if my public image creating bunch is not as good as his ISPR… but T-shirts! What about me, God, where’s my T-shirt? That’s my electorate out there that will be wearing his shirt! We made all those trains and roads and bridges and I just said goodbye to the IMF so impressively. Did nobody read or hear what IMF’s Harald Thumb, sorry Finger, said about Pakistan’s economy doing well? Finger said (really, these goras have the strangest names) he was satisfied, that we have lots of construction activity and a good private sector credit growth, and more investment because of the Chinese corridor. I want to mention other good things he said too, but the bijli has just gone so I can’t read this list. I will read it and tell you when I get home because the bijli never goes in my house, and in Shahbaz’s house, and the houses of my colleagues and friends. But of course you know all that, God. You know everything. So you also know about my government computerised NADRA, and we can now check to see if we have any strange people in our family tree. Many people called NADRA to say they had many strange people in their family and asked NADRA to help get rid of them but NADRA had to tell them they were talking about illegal people and terrorists, and those sorts of strange people, not their in-laws. See what we have to deal with? If I was like that Raheel man and his colleagues, I would settle everything with a gun but we don’t settle things that way, we settle for not settling them at all. Anyway, why use guns when you can use money? And cunnactions? Guns are so passé. Ha. I learnt that word from Tehmina. Maybe she used it in one of her books. They say her last one about silly things in sorrow times or something like that was awful, so maybe one of her other books? Anyway, she told me that word and I memorised it. Passé. I like that word. It means ‘purani baat’(old news). Like Zardari sahib, yaar woh passé ho gaye hain (Man he’s become so passé). Hehe. Or like recently when someone asked me about the Panama foolishness as I stood at the podium, I waved my hand (which has dimples on the knuckles, seriously, they’re so cute) and said carelessly: That’s so passé. Let’s talk about the PCEC instead, the Pak-Chinese corridor thing, one of my many achievements. That was so definitive, and I tried dropping the mike after that like Obama did but my bodyguard, who’s always trying to get on camera, caught it before it hit the floor, the idiot. ‘Take Kashmir, just give me this recipe’, but he left without having lunch. After all I’m just as pretty as that Raheel man is, more than he is, I have dimples, and not just on my knuckles I also have a big one on my chin, he has none, although he may have some but not where we can see them. As for mine, my mother used to do meray dimple ka sadqa and distribute nihari all over the muhallah; I wonder what his mother did? But Shahbaz tells me I can’t say that either. Boo. Really, it looks to me as if now I can’t do or say half the things I used to be able to, I keep falling over that Raheel man. You’d think he was ruling the country not I, hain ji? ‘Panama Papers leak should not be used to introduce a ‘parallel system’ in the country,’ a useful thing to say, if only she had not added that she was one of my fiercest critics. She needn’t have said that. And then there’s my daughter who talks incessantly in tweets as women should; and that Mazari lady who’s no Tweety bird but she can talk too. So, God, please get me a T-shirt too, meray dimple ki qasam, and please also tell me what to say in my Independence Day speech. Should I mention that the army is getting too up itself, but that no one understands why that should just not happen, that really it comes under my government’s command and not the other way around? Shahbaz says I shouldn’t and I want to win the election, almost as much as I want that T-shirt. So thank you, God, I’ll wait for your advice. Note: This piece is a work of satire. The author is a freelance writer and translator. 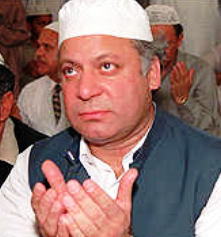 Nawaz should have dismissed Raheel and his top khaki forty thieves a while ago…before he put the black mark of Zarb a Azab on Pakistan’s history.